Looking for more AlejTech branding? Find it here. Widen your market by going online! Get an e-shop to sell your products or services. Having an online business will bring your more customers and a broad market for your products. The AlejTech E-shop content management system is an ideal solution for selling your products online. 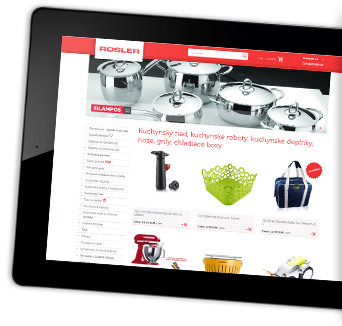 An online catalogue of your products. Usually contains multiple parameters for each product – name, price, manufacturer, physical dimensions, images, files for download, etc. Additional features can be added, such as related products or watermarks on images. AlejTech E-shop allows you to export and import products and categories from and to a database (Microsoft Excel). Any product in the catalogue can be, as expected, added to a user‘s cart. The cart has multiple features for better user expereince. After customers are finished with their shopping they follow through to finish their order. The order is automatically archived in AlejTech CMS and an e-mail is sent out to a predfined e-mail address or multiple addresses. Each order has a status assigned, depending on its current level of completion – received, confirmed, accepted, paid-for, finished, etc. Each customer can be automatically notified by e-mail when their order changes status. A user registration system can be implemented – customers are then able to see their past orders, manage their delivery address, etc. It is quite simple to link AlejTech E-shop with our intranet system AlejTech Intranet or customer relationship management system AlejTech CRM and thus cover the whole range of customer management and internal company administration. Check out a detailed list of AlejTech E-shop features. We‘ll be happy to provide you with a quote for all your web-based projects. Really great support from your side! It’s a pleasure to work with you!